Dubai, UAE, May 13, 2018: It is common knowledge that oxygen is an essential resource for cell life. 62.5% is the percentage of human body mass that is made up of oxygen. 3 minutes is how long a cell can survive without oxygen. These uncompromising numbers demonstrate how essential oxygen is to skin cells. Oxygen is essential for them to produce the energy they need for correct metabolism and to preserve the vitality of the skin on a daily basis. And yet, we live in a world without enough air! 9 out of 10 city residents are affected by atmospheric pollution all around the world. In Europe, pollution reduces life expectancy by an average of one year per person. Pollution, stress, fatigue, UV rays, etc. Daily exposure of the skin to an urban lifestyle reduces the oxygen supply to skin cells. But the environment is not the only culprit! The rhythm of cellular respiration decreases with age, and as the cells become lazier, the cellular energy production is diminished and the entire skin mechanism goes out of breath. These signs show through accelerated ageing, redness, dull, muddy complexion and dilated pores which are the first visible signs of decreased cellular oxygenation and of a polluted atmosphere. The skin must breathe in order to rejuvenate and what it needs is an “all inclusive” exfoliating, oxygenating, and regenerating product. Resurfacing, Plumping and Reoxygenating, this unique, fresh and sensory application procedure boasts spectacular results, that are noticeable after just one application. Action 1. Offers complete resurfacing with gentle exfoliation thanks to the 6 micro-peeling cocktail which accelerates the skin’s natural exfoliation process and encourages its regeneration. It combines the stars of aesthetic peels, AHAs: Anti-wrinkle glycolic acid, radiance boosting phytic acid, pore reducing citric acid, skin texture perfector salicylic acid, and complexion unifier mandelic acid. This cocktail of AHAs with its complete action is combined with the famous gluconolactone, which is an active keratolytic itsel, and very gentle on the skin. Action 2. Sees the dynamic duo, hyaluronic acid and Filorga’s signature polyrevitalisation complex, NCTF combine for the ultimate hydrating and plumping action while Action 3 contains Oxygen_Captor complex, which comprises bioactive oxygen sensors for express oxygenation! Say goodbye to a dull complexion! The effective formula is also an addictive one! A refreshing agent has been included to boost the thrilling sensation on application, so there are no compromises on pleasure. The skin is instantly soothed and revitalized. This relaxing sensoriality lulls you gently to relax, and to sleep. OXYGEN-PEEL can be used after make-up removal to perfect its results, and before the serum or skincare to allow the skin to be reborn just like new, every day. Its convenient well-pump delivers just the right amount of product onto the cotton pad. Apply the lotion all over the face and neck, avoiding the eye contour. No need to rinse. Its high tolerance means it can be used by all skins, even the most fragile. In just five seconds, your face will light up with new radiance. The perfect solution for a new skin effect 24/7, targeting wrinkles, pores, radiance and evenness. There’s no doubt about it, to try it is to love it! 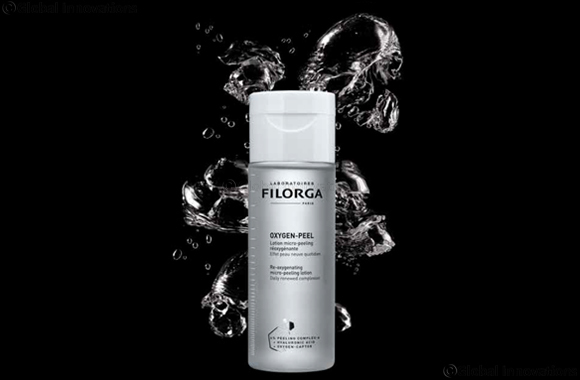 Filorga OXYGEN-PEEL (AED 185) is available for purchase at leading pharmacies including Bin Sina Pharmacies, Boots Pharmacies, Supercare Pharmacies, Planet Pharmacies, Health First Pharmacies and Community Pharmacies.